Bee and Wasp Control is something that everyone in the United States will encounter several times throughout their lives, bee and wasps are considered stinging insects and their control will be regulated by each states department of agriculture or some other state regulatory agency. Bees and wasp control requires the operator to have special pest control license and insurance to spray the offending stinging insects. You should never have a company treat your bee or wasp problem that does not have verifiable licenses and Insurance to spray chemical in a home environment. You should be VERY CARE when dealing with any type of bee or wasp nest removal, these insects can be very aggressive and will attack in very large numbers, they will continue to sting the offending creature until the threat is eliminated, this often times equals a person or domesticated pet being stung hundreds of times. 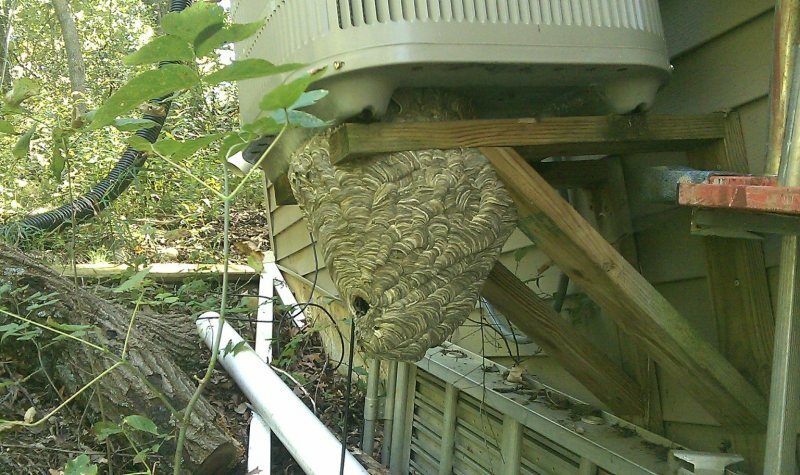 We deal with the following types of stinging insects: Bald Face Hornets, Paper Wasps, Yellow Jackets, Honey Bees, Africanized Honey Bees, Blue Winged Wasp, Carpenter bees, Potter Wasps and Spider Wasps. We can handle any type of bee or was problem you may have, we have removed nests and treated areas that often include walls, crawlspaces, attics and roofs, we also remove nests from tree areas that are near areas where they may be a problem. If you are having a problem with any type of stinging insect, just contact one of our qualified pest control professionals in your area today, simply choose the state and city that best represents your location and call the number located on the page. If you have any questions or concerns you can always reach out to us by clicking the contact us button on the top of the page.